Piperazine diHCl is an antihelmintic for use in drinking water or feed. Piperazine diHCl is a hygroscopic, alkaline chemical, well soluble in water. Piperazine diHCl is an antihelmintic for use in drinking water or feed. Piperazine diHCl is a hygroscopic, alkaline chemical, well soluble in water. Piperazine blocks neuromuscular transmission in ganglia of specific helminthes (acting as a competitive antagonist for acetylcholine [serotonin]), thus causing paralysis to the helminthes which are excreted with the faeces. 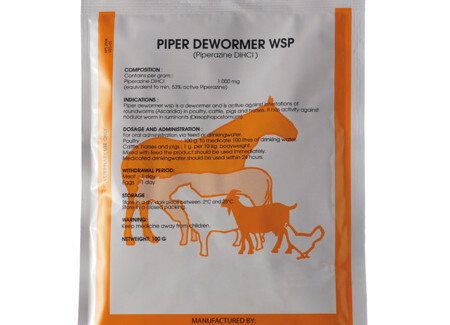 Piper Dewormer wsp is active as small-spectrum antihelmintic against infestations with roundworms (Nematodes) in poultry, cattle, horses and pigs. 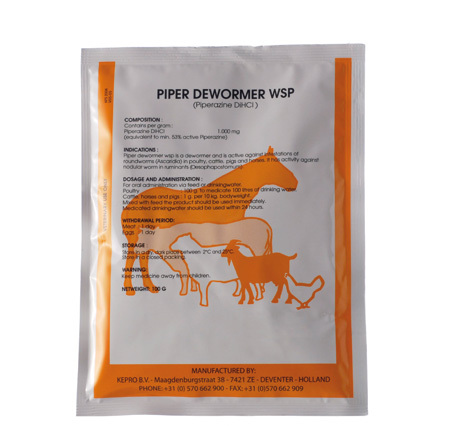 It has no effect on lungworms and on larval stages of Ascaris worms. Cattle : Ostertagia, Haemonchus, Trichostrongylus and Oesophagostomum spp. Pigs : Ascaris suum and Oesophagostomum spp. Dot not administer to animals with a severe impaired liver or kidney function. Do not administer to animals hypersensitive to piperazine. Do not combine with organic phosphorous compounds like pyrantel and morantel. Overdosing may cause unrest, ataxia, tremors, apathy and paralysis. Poultry : 300 – 500 mg per kg bodyweight; 100 – 200 g per100 liters of drinking water. Cattle, horses : 1.5 – 3 g per 10 kg bodyweight. Pigs : 2 – 2.5 g per 10 kg bodyweight. Mixed with feed, the product should be used immediately. Medicated drinking water should be used within 24 hours. Treatment can be repeated within 30 – 45 days. PE-Pharma jars of 500 / 1,000 g (12 jars per box).